Even though the program has officially ended and I’ve left Jordan- depending on who you talk to, I’m still in the Middle East since I’ve country-hopped to Turkey! I’m staying with a friend of mine from Tufts and seeing the sights in Istanbul before finally setting of for home. I find Turkey to be really fascinating because while included in Wikipedia’s “Traditional definition of the Middle East”, the country, and literally this city, bridges Europe and Asia. Suitably then, it is also included in Wiki’s list of recognized European states. If we want to be technical (which we do), I continent hop every day when I cross the Bosphorus, simply going from one part of the city to the other. From what I’ve seen though, the Asian (read- majority) part of Turkey isn’t acknowledged so much/at all. I flew in on a 2 hour flight on Turkish Air in which I was served a hot breakfast- I can see why they won the Best Airline in Europe award for 2011. Seriously, it’s rare to even get good drink service on a two hour flight, let alone a full meal. Driving around the city, I see signs telling me that Istanbul is the 2012 European Capital of Sport. Today, I saw the heaviest chandelier “in all of Europe”. I put off buying things here for a long time and now I’m scrambling to get things before I leave on Friday morning. It has somehow come to that time without even realizing it. As I buy gifts though, I start to remember something- I’m really bad at haggling. Like really bad. When I was in China, most of the time I had one of my guy friends do my haggling for me .Even though everything was so cheap there, it’s likewise so necessary to haggle to get closer to a real price. I have a bad tendency to just accept the price given as the price to be paid because haggling just isn’t a thing in the States! For sure though, I’m better off here because the only Chinese I knew was “Hi.”, “How are you?”, and “Too expensive!” In theory then, I should be able to get a better deal. What actually happens is that a lot of the time I don’t end up buying anything. I recognize that 20JD is far too much for a scarf, no matter that it’s being sold at a more upscale souq or that it’s beautiful. No way am I going to pay that. So I just sigh sadly and move on. Most of the time shopkeepers don’t get the hint that I would pay something a bit less for it. Maybe I’m too subtle? Other times, when I do try to haggle, I don’t go nearly low enough. I get that as a foreigner you feel free to jack prices way up, but man I didn’t know how much. A lot of the time I won’t know how much something is worth but I won’t pay 6JD for earrings when a couple stalls down earrings are only 1JD. I don’t want to say a price so low as to offend someone but goodness! Thinking back now to China, I really don’t know if I did get any good prices. In one specific instance I just needed to have this jade horse sculpture. It was supposed to be a gift for my uncles (sorry guys!) but in the end I kept it because I loved it so much. I went around the shop and tried haggling with the woman on two different occasions. Fairly certain she didn’t recognize me the second time around since she gave a completely different price- different from what we had haggled down to and I had found unacceptable and different from what she had originally quoted me. I think it might have actually been higher. So we went at it again. I’m not sure what we originally settled on but it probably wasn’t a fair price. Maybe a fair foreigner price, but that’s a big maybe. I was a 15-year old romping around the Great Wall with maybe 100 other People-to-People ambassadors. I’m sure we were a gold mine. And you know what? Sometimes I don’t mind being that goldmine. Their standard of living is so much lower than mine so even if I’m a poor college student in the U.S., my situation is far better than theirs. My heart goes out to the elderly shopkeepers because they look like they really need the money and not as if they’re just trying to rip me off since I’m a foreigner. If people will pay a certain price, I don’t blame shopkeepers for trying to charge it because their situation is so much more desperate than mine. So sometimes, I pay up and don’t give too much of a fuss. When I live in a place though, it gets old after a while. If I need to catch a taxi back from City Mall or Rainbow Street, it’s a consistent problem that taxi drivers may try to charge me 5JD for a 1JD cab ride, or turn off the meter once we’ve left the immediate area, or demand more than what is owed. My limited Arabic is certainly better than no Arabic at all. I have no idea how people who don’t know Arabic get around without getting ripped off. After I took a pony ride at Petra, the owner asked for double the price because he had run as well. I felt really proud of myself and invigorated because I was able to defend myself in Arabic and won the argument. But I felt bad when I thought about it afterward because his situation isn’t great, having to live off of tourists and being outside all day. It’s certainly not very stimulating but it brings the money home. That’s one of the big things I took away from Petra- there’s a lot of desperate need there. As we were exploring Petra, a shopkeeper called out, “Come, and have a cold drink! Eat!” Per usual, we continued on walking, trained to ignore anyone that calls out to us, whether they be legitimate or wolf whistles. But then he added, “This is why you’re here- to help the local people.” That statement really took me aback and I remember saying to myself, “No, I’m here to see PETRA.” Which is the truth. My one and only goal in coming to Petra was to see the ruins and be in awe. Helping out the local community at the time with my business? That’s an added bonus, but definitely not the reason I came. So in the next few days, I’ll be buying more gifts. It’ll be interesting, trying to balance getting a fair price without robbing people blind. I doubt I’ll get any good deals and I’ve accepted that because things are still cheaper here than at home. But we’ll see how it goes. My schedule and sense of time is always a little off in Jordan. Seven hours ahead of EST, except when Daylight Savings Time started about a month later here and we were only six, my daily schedule varied from waking up between 7 and 11 in the morning. The exact time of the first call to prayer changes daily, and is currently around 4am while at the beginning of the semester, it was closer to 6am. At times, it has been the first thing I heard after I woke up and at others, the last thing I heard before I went to bed. Classes are from Sunday through Wednesday and I’m always confused as to what day it actually is. Days of the week in Arabic are essentially numbered, i.e. day one, day two, etc. Should be easier to remember that way, right? Nope, after 3 years of Arabic I still have to count from youm alahad (Sunday) to figure out what the equivalent day is in English. And don’t even ask me what day of the month it is. I got myself a one-a-day calendar to try to remember but let’s be serious- I never know in America what day it is either. It doesn’t help that Middlebury starts and ends so much later than all other programs. So even before I came to Jordan, I was already in the habit of lazy days back to back where I would never have to check the date. It’s unreal that college graduation pictures are getting posted when I’m still in classes. Last day tomorrow though, whoo! Even though I’m still in “school” mode, I can already tell the seasons are changing. Just ignore the fact that we had a “chilly” day yesterday- no sun, a light breeze, and a few raindrops! In general though, the weather is warmer, classes are winding down, and the foreigners are swarming into town. Finals are looming around the corner. Or at least, they should be. I should be concerned about them, I should be studying and processing all that I’ve learned in class for the past few months. But as I see friends’ posts on Facebook about cramming for finals, turning in papers with minutes to spare, the horrid people who make noise in the library HOW DARE THEY OMG!-That all seems like a different world. It doesn’t just have to do with the fact that my program started nearly a month after spring semester in the US. The entire culture and atmosphere of coursework is different here than in America. I am of course, studying abroad. However, I was blissfully unaware that study abroad is generally considered as a time to have fun, learn some culture while partying a lot, travel, and generally not take studies very seriously. Ok, this isn’t true for everywhere, but now you’re at least more informed than I was. Seriously. Person A: Yea, I’m really excited to go swimming at Wadi Rum! Jordanian friend + the rest of us: Huh?! Person A: Yea, Wadi means “river”, right? Wadi actually means valley, which is still a geographical term and something which I had no idea of either. The more important part is that Wadi Rum is the opposite of a river. 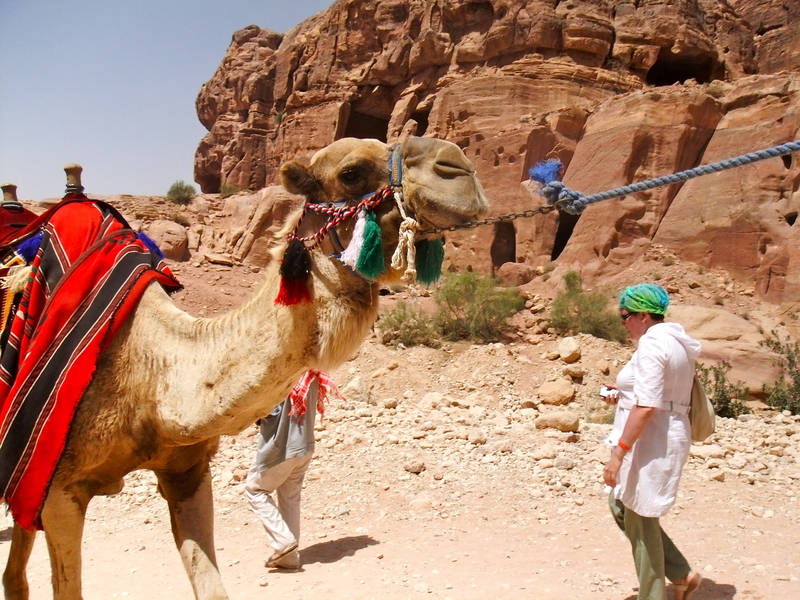 Posted in Uncategorized and tagged camel riding, desert, sand, Wadi Rum, why? At the end of orientation back in mid-February, the administration had us each write down a goal for our semester. Since we only have a month left in the program, today we got back what we had written. The thinking was that if we hadn’t already achieved our goal, then we could focus the rest of our time on trying to before we left. To be honest, I’m always really bad at thinking of anything to write down, and even worse at remembering what I actually wrote. The second part isn’t so bad though since you’re not supposed to consciously think of what you wrote. But for once, I had something that I did want to say and definitely achieve. I wrote: اريد ان اتكلم مع اسرتي اكثر وخاصة بالعامية. Direct translation- I want to talk with my (Jordanian) family more, especially in dialect. This is more than a little funny for several reasons. The first is that this was written in such an incredibly fushaa way. It’s the first real, concrete testament I’ve seen of how much my Arabic has changed. Just reading this to myself made me giggle a little. No matter how much I’ve resisted it, aamiya has snuck into my life and I’ve begun to accept some of it. I remember when we studied slavery in my U.S. history classes, everyone would always say that of course, they would have been abolitionists, don’t be silly! At the very least, they would never have owned slaves and would have looked down upon the practice. That’s a wonderful, idealistic view of humanity. It wasn’t until AP U.S. History that I remember anyone ever saying that, you know, if you were raised with slavery and it was a part of your everyday life, you might not have been against slavery. That your family might have owned slaves and since it was what you had always known, you would have been ok with the practice or even supported it. And heaven forbid someone should try to take away your right to own a slave! But where are all the scones?! So I jetted off to England for a very untraditional Spring Break- it was awesome. I spent the first four days in London, crashing on Duncan’s floor (thanks dude!). We ended up moseying about mostly but managed to catch the highlights of a bunch of things. Even having been to London and specifically some of the same museums before, I definitely saw new things. Reason #1? We got old. This was the first time I’d been unsupervised by anyone (parents, teachers, family friends- I’ve done them all). Plus, I turned 21 the first day of break! Seriously, where did the past year go? We’re not really that old but we’re definitely getting there and it’s craaaazy. Reason #2? This was the first time I barely planned. Totally not like me at all and OK, that wasn’t the plan. The truth is I just ran out of time since I finally decided I was going to England maybe 3 days before I left. And then there were midterms and surprise moving as well! But it ended up being great. Other friends were visiting at the beginning of my trip and then others were popping back to England before leaving again so there was an ever-changing stream of people to keep us occupied. As you can gather from the title, I’ve moved! Goodbye, homestay- sadly, I shall not miss you. Why move, especially now, when the semester is half over? Today is the first day of spring break (and my birthday wooo!) but after that we only have a month and a half before the end of the program. Why not just stick it out? Trust me, my roommate and I tried. There had been a lot of issues, that just kept adding up over time. First, there was confusion about water, and then the ever-changing situation with the Internet: “We have wireless, use it whenever you want!”-> Don’t Skype earlier in the evening-> Don’t use the Internet until later at night when the family has gone to bed->Don’t use the Internet at all, go buy your own broadband USB sticks-> the program administration telling them we have to be allowed to use the Internet since that was what was originally established. Then there were a whole host of uncomfortable things with regards to the servant in the house (a whole post worth-stay tuned! ), our family didn’t ever seem to want to talk to us, everyone in the house was always unhappy (because of us? who knows), we didn’t have keys, we were sleeping on very poor-quality cots, etc… We were essentially paying more than anyone else for a worse experience, the only benefit of which was not having to worry about food.